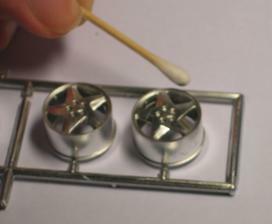 The SnJ polishing powders can be used for much more than just enhancing the effect of bare metal aircraft models. The aluminum polishing powder (cat.nr. PPAL (Hawkeye's Hobbies) or 1358 (old SnJ number) ) is ideal for repairing factory-plated parts, for simulating chrome on car models and even for turning clear parts into mirrors. Please note: SnJ Model Products was acquired in 2008 by Hawkeye's Hobbies LLC. In August 2012 Hawkeye's Hobbies announced that its paint production has ceased and sales of its products have ended indefinitely. However unlike the paints, the polishing powders have a very long shelf life (I'm still using the powder I bought back in 2002) so it pays to try and find a bottle of polishing powder even if it is from old stock. 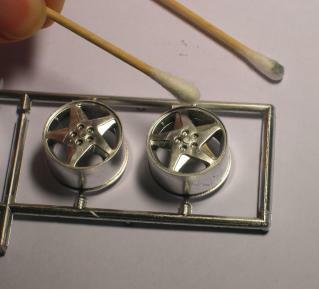 Plating on factory plated parts usually consists of a base coat of varnish over which a very thin coat of aluminum is applied. 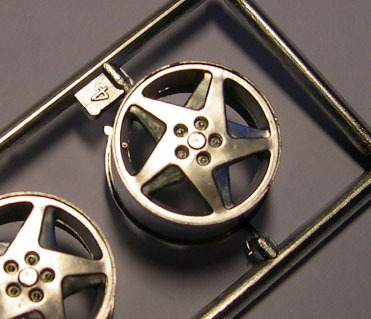 Most manufacturers do not apply a top coat of varnish over the aluminum plating so the coat gets damaged easily. 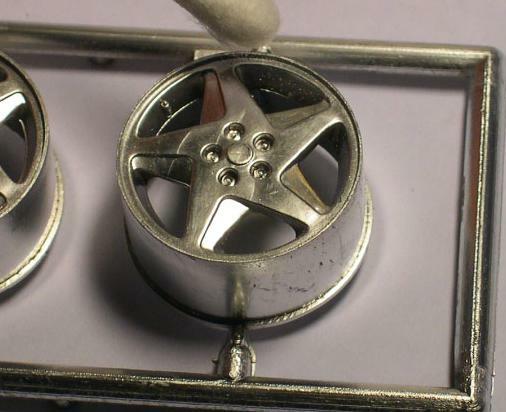 The pic on the right shows a set of plated wheels that was packed in with some other part trees, resulting in scuff marks on the edges of the rims. SnJ powder can be used to touch up small scuff marks and the repair will have the same sheen as the original plating, as long as the base coat wasn't damaged. 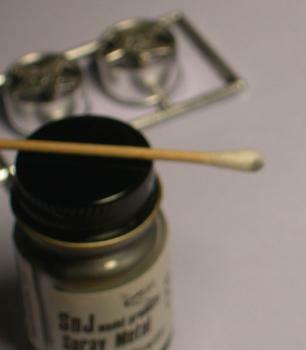 Apply a tiny amount of SnJ powder to the tip of a cotton bud. Rub the cotton bud with the powder across the damaged areas. Rub repeatedly to apply more powder. Finally buff the touched up areas with a clean cotton bud. If you want a high-gloss (bright chrome) effect a cotton bud won't be soft enough, use a piece of a worn T-shirt or similar soft cloth instead. Click on the picture for an enlarged version showing the touched up areas.